Sneakers — they're a massive trend this season. Add a pair of stylish sneakers to your wardrobe right now, and you can instantly update all your outfits for spring and summer. Once reserved for gym wear, today sneakers are a stylish staple to be worn with all your wardrobe basics. From skirts and dresses, to pantsuits, jeans and shorts outfits, you're going to see women wearing sneakers just about everywhere this year. So which sneakers should you invest in, to look current in fashion now? We're here to inspire you to shop the hottest sneaker trends, with our street style roundup of the most stylish sneakers everyone will be wearing this year. Graphic, wallpaper-inspired flower prints are a major women's accessories trend for spring and summer this year. These white running shoes with a bold floral pattern, overlaid atop classic stripes, may be the sneaker of the season — and have inspired tons of copies. 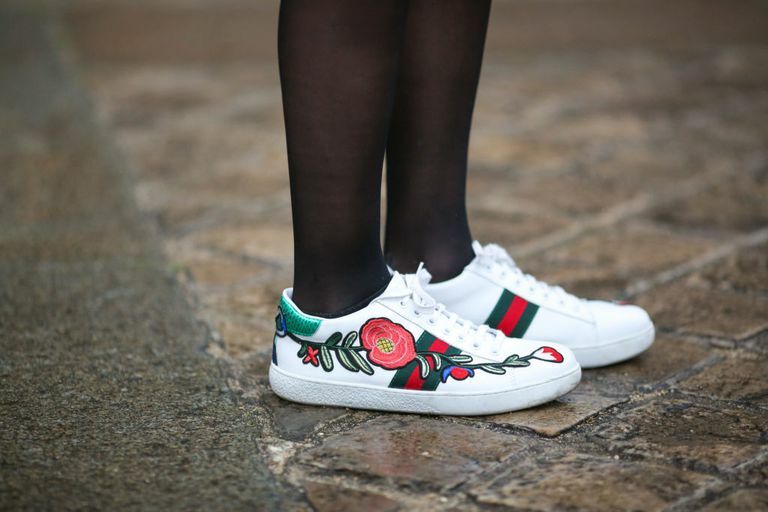 If Gucci kicks aren't in your budget (join the club), you can find affordable versions of these stylish sneakers at fast fashion retailers such as H&M, Aldo or Zara. Calling all Spice Girls! Platform sneakers just like the fab five wore are back in fashion this year, and were even seen stomping down some designer runways for the spring/summer season. These sneakers are not only super trendy, they can give petite women a needed boost of height. Here's how haute couture brand Givenchy translated this trend, in a stylish black sneaker with statement-making gold platform heels and dazzling deep red stars. In a classic color palette of gold, white and red, these Pegasus sneakers by Nike will look great with so much of your wardrobe. This is a classic color combination that can be worn almost as a neutral in your wardrobe. Wear these stylish sneakers with everything from white skinny jeans, to denim mini-skirts and floaty summer dresses. Pastels are a massive trend in women's clothing and accessories this year. These sweet pastel sneakers from the Nike sportswear brand are perfect for wearing with all your outfits for weekend, casual days and even the office. 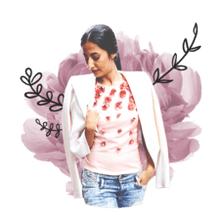 Try wearing these stylish sneakers with pastel colored pantsuits for work, or with a maxi dress for concerts and festivals this summer. Call it part of the athleisure trend — this season, designers have declared puffy sneakers a thing again. This style is basically an exaggerated, retro-cool take on "dad sneakers" that's super fashionable for women now. Wear old-school inspired puffy sneakers, such as this fab pair by the Louis Vuitton fashion house, with all your track pants, sweatpants and leggings, for a stylish, sporty vibe that feels current. Or take a fashion risk and pair puffy sneakers with trousers and maxi skirts, for a high-low contrast that will feel super fresh. How adorable are these emoji sneakers from Daniel Footwear? Classic white sneakers with expressive emoji decals are great for summer — and perfect for starting conversations, or wearing on a date. Try wearing cute emoji sneakers to add cheeky style to a basic outfit in denim shorts and a white t-shirt, and with mini-skirts this summer. Prowling the city this summer? Show off your fashion stripes in these fierce orange and black fashion sneakers by the Dolce and Gabbana fashion brand that are tiger-level fierce. Boldly colored sneakers are especially great for adding interest to your outfits in all black. They’d also look pretty cute with track pants, leggings, and other athleisure wear staples. How classy are these white and black sneakers by Valentino, designed to look like saddle shoes (a classic menswear oxford loafer)? You'll find more sneakers available now that mimic dressier footwear styles, so you can wear them with more bottoms than just shorts or jeans. Easy to wear with anything, these stylish sneakers will look especially cool with pleated skirts and romantic summer dresses. Black leather sneakers are a great alternative to loafers for wearing to the office, especially when your commute involves lots of walking (or subway stairs). These black runners with fuzzy pastel uppers by UK-based shoe retailer Zign will add a youthful vibe all your work outfits in trousers and jeans. We think they'd look especially cute with skinny black pants and a blouse or shell in a color that picks up on the pastel detailing. These hot wheels inspired high-top sneakers by Converse are too cool for school. With red and yellow flames on a black background with white laces, they're the perfect running shoes for indulging your childhood nostalgia and adding retro hipster cred to all your spring and summer outfit looks. Try wearing them with red jeans. Camo print goes (way) upscale with these fashionable olive and yellow sneakers with feather detailing, by Italian footwear brand Elena Lachi. Thick white soles inspired by old school dad sneakers are also trendy and provide a great contrast to the colorful uppers. Wear boldly stylish shoes like these to add interest to an all-black outfit. They'd also look amazing with this year's trendy cropped jeans. These sneakers by the Etro fashion brand are the footwear equivalent of mixing patterns in your outfit. With multiple prints and colors going on, these shoes have an amphibious look that's super cool for wearing with dark wash jeans. You could also pair these fun shoes with leggings or trousers in a shade picked up from the sneaker pattern. You'll be golden this summer in streamlined black suede sneakers with a gold dipped toe (these are by Puma). Wear these fancy kicks with a black pantsuit to look fresh for the office, or pair them with matching track pants for a sleek athleisure look, as pictured here. Sneakers with brooch-style decals and add-ons are going to be hot this year. We love this simple, stylish pair by Veja, adorned with floppy flower doodads.